Using bamboo screening as a fence is a relatively affordable way to give privacy and shade to your home and garden. Bamboo slat screening is a natural material bound together with galvanised wire. Bamboo slit fencing on a roll is easy to fit to chain link fencing or other garden wires by using plastic ties. To fit bamboo screens to existing wooden garden fences garden galvanised staples should be used. Our split bamboo screening is available from 1 metre high up to 2 metres. We are a large UK company specialising in garden fencing and screening for both the trade, landscape gardeners and anyone who loves to garden. We carry huge supplies in the UK. Large and small orders welcome. Other garden fencings we have in stock are Bamboo Fence, Reed Fence, Heather Fence, Thatch Fence, Brushwood Fence, Fern Fence, Bamboo Cane Fence and Willow fence. We offer free advice. Please call 01757 289273. This garden slat fence will enhance all gardens, patios and deckings. 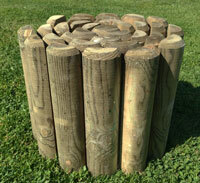 It can be used as boundary fence or as a garden screening to create separate areas within your garden. When used over arbours and pergolas it creates a soft shaded area beneath for those hot summer days. Simply attach to garden fence uprights with ties or staples. Ideal cover to chain link fencing. Can be used to screen unsightly areas such as compost heaps, rubbish bins, gas and oil tanks. Dimensions : 4 metres (13' 3") x 1.5 metres(5' 3"). 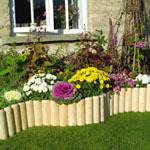 This garden natural fencing and screening will enhance all gardens, patios and deckings. It can be used as boundary fence or as a garden screen to create separate areas within your garden. When used over arbours and pergolas it creates a soft shaded area beneath for those hot summer days. Simply attach to garden fence uprights with ties or staples. Ideal cover to chain link fencing. Can be used to screen unsightly areas such as compost heaps, rubbish bins, gas and oil tanks. Delivered in a portable carry bag. This height of split bamboo screen is perfect for protection of taller plants and masking bins. It is useful for all ideas in garden screening and privacy. It is a very affordable type of fencing, with a host of screening and decorative applications. Dimensions: 3.8 metres (12' 5") x 1.2 metre (3' 11"). Dimensions: 3.8 metres (12' 5") x 1.2 metre (5' 10").